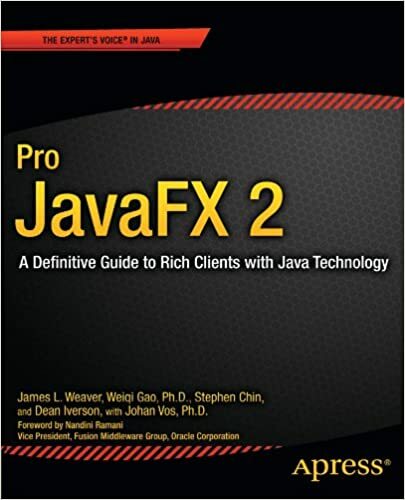 In Pro JavaFX 2: A Definitive Guide to Rich Clients with Java Technology, Jim Weaver, Weiqi Gao, Stephen Chin, Dean Iverson, and Johan Vos show you how you can use the JavaFX platform to create rich-client Java applications. You'll see how JavaFX provides a powerful Java-based UI platform capable of handling large-scale data-driven business applications. Covering the JavaFX API, development tools, and best practices, this book provides code examples that explore the exciting new features provided with JavaFX 2. It contains engaging tutorials that cover virtually every facet of JavaFX development and reference materials on JavaFX that augment the JavaFX API documentation. Written in an engaging and friendly style, Pro JavaFX 2 is an essential guide to JavaFX 2.